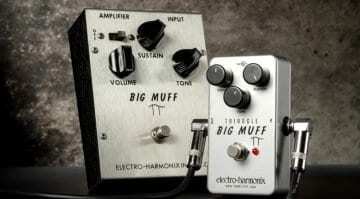 New York pedal company Electro Harmonix has just announced three new fuzz/dirt/preamp pedals at once! The new Electro Harmonix Nano Battalion, Flatiron Fuzz and Sovtek Deluxe Big Muff Pi join the company’s line-up just in time for Christmas. 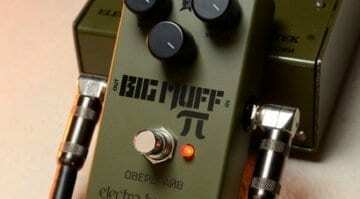 Mike Matthews’ Electro Harmonix brand has released an insane amount of variations on their legendary Big Muff Pi circuit over the years. I suppose, though, that if they didn’t do it, then some smaller boutique pedal company will. 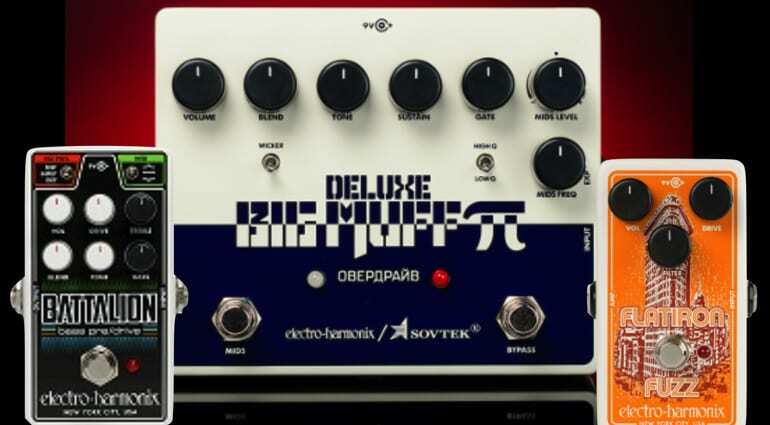 The new Sovtek Deluxe Big Muff Pi is based around the classic 1991 circuit known colloquially as the ‘Civil War’ Big Muff and named after its blue and grey paint job that reminds players of the colours worn by the North and South during the American Civil War. The circuit itself was essentially the same as the ‘Tall Font Sovtek Green Russian’ version, but it got a new paint job it got nicknamed accordingly. 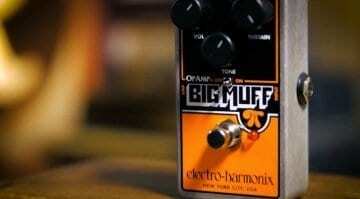 Electro Harmonix, Sovtek Deluxe Big Muff – The Civil War Muff! This incarnation is a Deluxe version with some extra features. These include a Wicker switch to bypass the Tone circuit, a Mids EQ control to add mid-range frequencies via a parametric EQ and Gate to keep the noise floor down. The latter is useful for taming hiss and whatnot. There’s also a dedicated footswitch for toggling that Mids EQ. A handy Blend control allows you to mix the dry and distorted signals. The real kicker is that it has an Expression Pedal Input for sweeping the Mid EQ. That gives you a wah-like tone when needed, which is really cool. Inside, there’s a set of trim pots to adjust the Mid EQs even further. Another useful switch is used to add a buffer on the Big Muff’s input circuit. The pedal is also true-bypass, so it won’t affect your guitar’s tone when not engaged. This pedal can be powered by a 9V battery or external power supply. 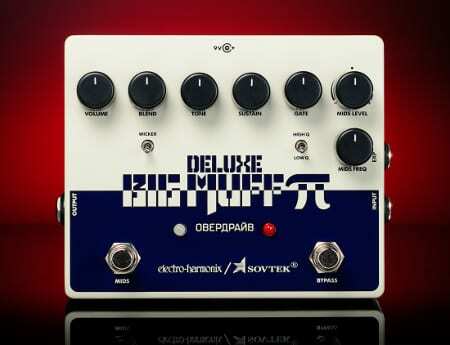 For all this control and for such a lot of handy features I think the asking price is insanely cheap for a Big Muff. I reckon they will sell shed loads of these! Next up is the new Flatiron Fuzz, EHX’s take on the RAT2 circuit. It’s an Op-Amp-based Distortion/Fuzz, and EHX says it has improved on the classic late 70s circuit. I’m a big fan of the RAT2 and own a few of the originals because of their great and versatile tone stack. 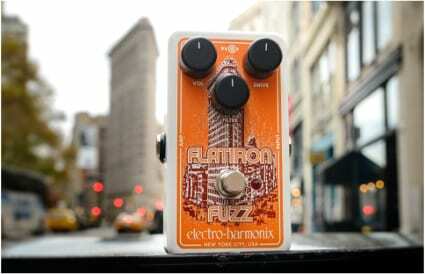 This version by EHX is named after the Flatiron Building in New York City. The Filter control is part of the circuit’s charm. It’s basically a low pass filter with a sweepable cut off frequency. The Gain control goes from a small amount of dirt to full-on fuzz tones. It’s all based on a hard clipping circuit that uses an Op-Amp. Then you dial in the Volume to your desired level. 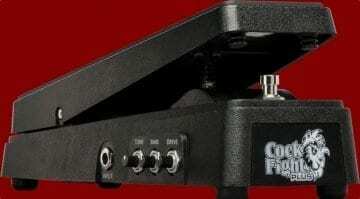 This pedal is true-bypass and can be used with either a 9V battery or external power supply. It is cheap enough, but I’m not sure how well it will stack up against an original. But I’d be interested to hear one. Unfortunately, there is no video demo of this one yet. 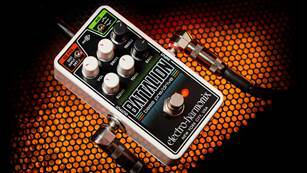 The new Nano Battalion is a bass preamp and overdrive pedal. It’s based on a MOSFET drive circuit and aimed specifically at bass players. It has a three-band EQ: Treble has a boost/cut above 1kHz, Bass boosts/cuts below 200Hz and the Mid switch gives a 9dB boost or cuts at 500Hz. Perfect for sculpting your bass tone and should be great for keeping your low end intact. A nifty feature here is the signal routing option. You can choose to route your signal in one of three ways. Distortion Mode means it’s before the EQ circuit, Input Mode has the EQ circuit first while in Dry Mode the EQ only affects the dry signal. When a standard TS cable is connected to the output jack of the Nano Battalion it gives a standard unbalanced signal. When a TRS cable is plugged into the same jack output socket, it outputs a balanced signal instead. That’s handy for recording DI straight into a mixing desk or DAW. The Nano Battalion has some neat functions. Especially, I like the three-way distortion idea and the balanced output option.